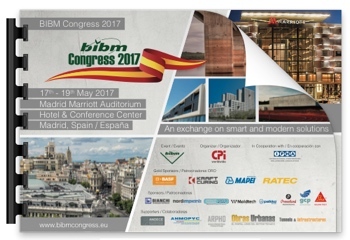 The 22nd BIBM Congress 2017 took place on 17-19 May 2017 in Madrid, Spain with more than 650 registered participants, including exhibitors. 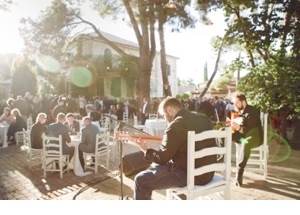 The Congress offered more than 30 presentations with three plenary and three parallel sessions showing interesting best examples in sustainable production and promoting sustainable markets. 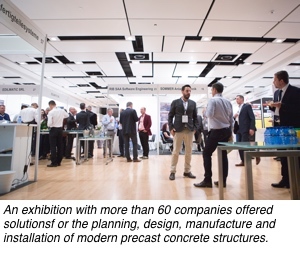 An exhibition with more than 60 companies offered solutions for the planning, design, manufacture and installation of modern precast concrete structures. After the welcome of BIBM President, ANDECE President and the BIBM Secretariat, the Congress offered a setting the scene session with presentations about the construction sector market conditions and policy developments, the impact of COP 21 on the sector and the impact of European policies on the daily business of concrete producers. Throughout the Congress, examples from Latin-America varied the EU focus of the lectures and brought a new different insight into the European scene. 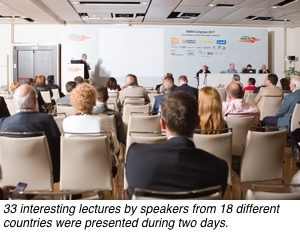 Parallel sessions were organised to offer exciting lectures for audience with both technical and marketing background. Its carefully organised schedule enabled participants to switch sessions to listen to a presentation. Networking coffee breaks and lunch breaks took place in the exhibition area where more than 60 exhibitors presented state-of-the-art solutions for the precast industry. The sustainable production sessions were moderated by Alessio Rimoldi, Secretary General of BIBM and the lectures varied from issues such as circular economy, innovation, Environment Product Declarations (EPDs), health and safety of workers. Promoting sustainable markets sessions were moderated by Dr. Ulrich Lotz Chairman of BIBM Communication Commission, Gernot Brandweiner Chairman of BIBM Technical Commission and Zsuzsa Amina Koubaa, European Public Affairs Manager of BIBM. Interesting market solutions and new market opportunities were presented. The last plenary session presented market developments for concrete such as Rebuilding vs. Renovation, urbanisation and energy saving innovations. 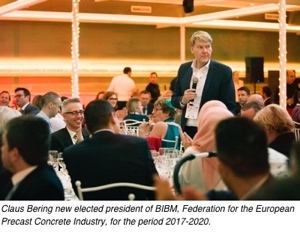 The BIBM General Assembly – held 18 May – elected the new President, Claus Bering from CRH Concrete, who gave his first speech at the Gala Dinner on Thursday evening. At the 22nd BIBM Congress, the BIBM General Assembly elected Claus Bering (CRH Concrete A/S) as the successor of Jaime Delclaux (NortenPH, Spain) new BIBM President for the period 2017-2020. During his Presidency, Jaime Delclaux ensured that the five-year strategic plan – started in 2011 during the Presidency of Patrick Declerck – was delivered and he promoted a smooth transition of old and new priorities. Working at CRH Concrete, a global building material group, Claus Bering brings a new global vision and a fresh approach to BIBM. While precast concrete is traditionally local companies, having a global, international approach helps to properly measure the market conditions and accurately predict the future opportunities. Even small local businesses need to consider leveraging resources at a global level if they want to effectively compete in the market. Learning from each other with a universal vision is the future of precast concrete industry, just as the Congress motto says, “An exchange on smart and modern solutions” is in demand. For the next three years, BIBM will continue to advocate for a stable, business friendly legislative environment at European level and fight for an equal level playing field for our industry. The priority partners and audience of BIBM advocacy work are the EU institutions (Commission, Parliament and Council), as well as European and international construction organisations.